Horses, ponies and foals from the age of 8 weeks. 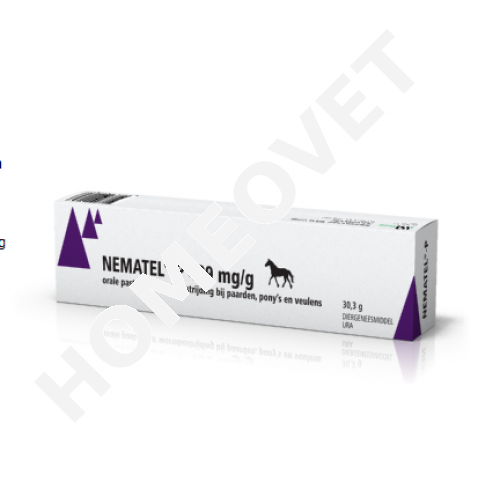 The product is intended for single oral administration in horses. The body weight should be determined as accurately as possible to administer the correct dosage, and should be verified proper operation of the metering system. The amount will be calculated and paste can be adjusted and put down with the adjusting screw on the crossbar of the injector. Then remove the cap from the injector, open the animal's mouth and squirt the gel as far as possible behind the tongue and allow it to swallow the animal. If swallowed by a hand under the chin and the head are stimulated to lift. Use during pregnancy and lactation is allowed. 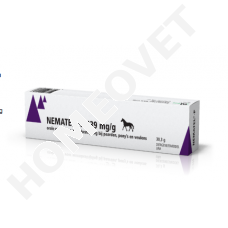 Overdose symptoms, emergency procedures, antidotes in five-fold overdose of the recommended dose for the treatment of nematodes are no adverse effects. In case of overdose symptoms such as salivation, spierfibrillaties, tachypnea, dyspnea, ataxia, tremors or convulsions and may be used as an antidote atropine. Interaction with other medicinal products and other forms of interaction and co-funds should not be taken with anthelmintic levamisole, piperazine or choline esterase inhibitors contain mainly oregano phosphates to be taken. Not known. If you are not listed in this leaflet, serious side effects or other effects, please inform your veterinary surgeon. Withdrawal time meat 0 days. Not permitted for use in mares producing milk for human consumption. Not above 25 ° C. Do not store in a refrigerator do not freeze. Out of the reach and sight of children. For the treatment of roundworms, large and small strengyliden oxyurids and the recommended dose is 19 mg per kg of body weight pyrantelembonaat. Injector for the treatment of 700 kg of body weight (see the scale on the injector) is determined. For the treatment of tapeworms, the recommended dose is 38 mg per kg of body weight pyrantelembonaat. Injector for the treatment of 350 kg of body weight determined.